Fond of Snape » Blog Archive » Two for the price of one! If you could only have one section of the bookstore to visit, which section would it be? Fiction…there is so much to go through there! If you could only subscribe to one publication for the rest of your life, what would it be? Bon Appetit I love reading about recipes and food and all that! What activity always makes you lose track of time? hahaha just about any one! Cobblestones, one of my fav places to go for a bite and/or a drink in my city. I am baffled by people who do not read fiction. That’s a whole lot of great reading you’re missing out on. I could probably live in the fiction section. I’d just need food and water delivered every once in a while! I love the fiction section too. I forget to do shoot from the hip. Is there a specific day to do it? I have forgotten that too! I would be in the large print section. I too love the light and feeling. Good one! That’s a great shot! 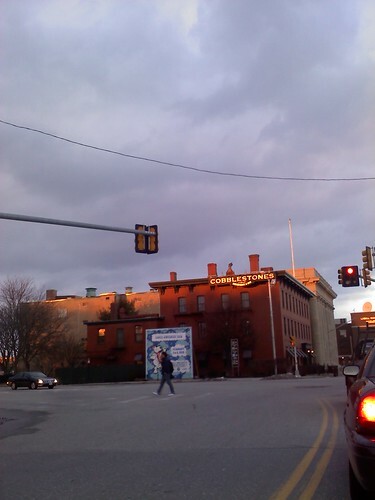 I love the lighting and the man walking across the street! Love you! If you could have a dessert right now what would it be? The one in the picture at the 13 Thursday site, especially if I could eat it in Cambridge.